សូមស្តាប់វិទ្យុសង្គ្រោះជាតិ Please read more Khmer news and listen to CNRP Radio at National Rescue Party. សូមស្តាប់វីទ្យុខ្មែរប៉ុស្តិ៍/Khmer Post Radio. Post by Muha Tirk Jet Kon Khmer. Post by I Love Cambodia Hot News. Post by Cambodia National Rescue Party គណបក្សសង្រ្គោះជាតិ. 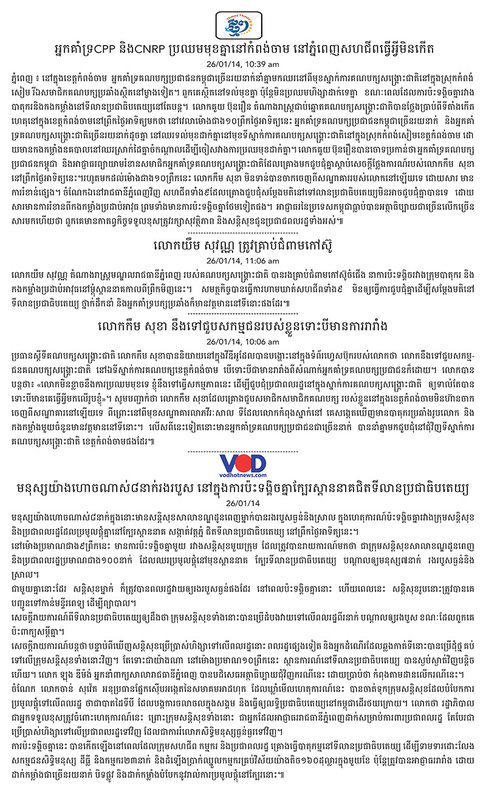 Post by I Love Cambodia Hot News II. នៅ​ពេល​ខ្លះ​ទៀត​កុំ​ថា​ឡើយ​ដល់​ទៅ​មាន​ គំនិត​ពង្រីក​ទឹក​ដី គ្រាន់​ប្រជា​ពលរដ្ឋ​ខ្លួន​ឯង​ចង់​យក​ដី​មក​វិញ​សោះ​ក៏​មិន​បាន​ដែរ ព្រោះ​ខ្លាច​បែកបាក់​សាមគ្គីភាព​ជាមួយ​ប្រទេស​ជិត​ខាង «ម៉ឺន​ណាំ!» ជួនកាល​គ្រាន់​តែ ខ្មែរ​គ្នា​ឯង​ហ្នឹង​លួច​ខ្សឹប​ដាក់​គ្នា​ឲ្យ​គេ​ធ្វើ​បាប​ខ្មែរ​ក៏​មាន គ្រាន់​តែ​ប្រជា​ពលរដ្ឋ​ជជែក​គ្នា ឬ​ក៏​សម្តែង​មតិ​លើ​រឿង​ទឹក​ដី និង​ជន​បរទេស​ខុស​ច្បាប់​ប៉ះពាល់​អ្នក​ជិត​ខាង ដូច​ជា​ប្រើ​ពាក្យ​ថា «យួន ឈ្លាន​ពាន​ដី​ខ្មែរ!» ឬ​ក៏​និគមជន​យួន​រស់​នៅ​ដី​ខ្មែរ​ខុស​ច្បាប់​តាម​ដង​ទន្លេ​ជុះ​អាចម៍​ដាក់​ ក្នុង​ទឹក​ឲ្យ​ខ្មែរ​ប្រើ» ឬ​ក៏ «បើ​ដេញ​យួន ឲ្យ​អស់​ពី​ស្រុក​ខ្មែរ គឺ​ដី​ខ្មែរ ខ្មែរ​ដើរ​យ៉ាង​រលុង​ក្នុង​ប្រទេស» ក៏​មិន​បាន​ដែរ គឺ​សួរ​រក​មុខ​នរណា​និយាយ​ឬ​ក៏​អ្នក​ណា​សរសេរ។ ហេតុ​អ្វី​បាន​ជា​អ្នក​ទាំង​នោះ​នៅ​មាន​គំនិត​តឿ​បែប​នេះ? មក​ពី​រៀន​បាន​តិច ចំណេះ​ដឹង​តិច​ពេក​គិត​មិន​ដល់​កោរ​គេ​មិន​បាន? ឬ​មួយ​មាន​បរទេស គេ​គាប​ពី​ក្រោយ​មិន​ឲ្យ​ធ្វើ​នេះ ឬ​នោះ​នៅ​លើ​ទឹក​ដី​ខ្លួន​ឯង និង​ក្រៅ​ប្រទេស? Post by Khmer Social Media. Ruling party supporters are “burning with hatred” towards the Cambodia National Rescue Party leadership and are ready to take to the streets, according to a Facebook post by Prime Minister Hun Sen’s second-eldest son, Hun Manith. “I might not be able to contain the CPP youth and supporters any longer.… Their hearts are burning with hatred toward the leaders of the CNRP from listening to the barking, cursing and insults to the CPP leaders and especially to the prime minister,” the comment posted on January 19 reads. “Please continue to be patient and be strong,” he continues. Hun Manith, who is deputy head of the powerful Military Intelligence unit, declined to comment yesterday and as of press time had not confirmed that he made the post himself. However, a source close to the prime minister’s son who declined to be named confirmed yesterday that the account belongs to Manith. Three government officials last night declined to comment on a news report claiming that Cambodia offered to provide the US Central Intelligence Agency (CIA) a site to interrogate and detain al-Qaeda suspect Abu Zubaida, following his arrest in 2002. In a Washington Post report on Thursday about CIA “black sites” created in the wake of the September 11, 2001, attacks, Cambodia is one of two countries in Southeast Asia cited that offered up locations. 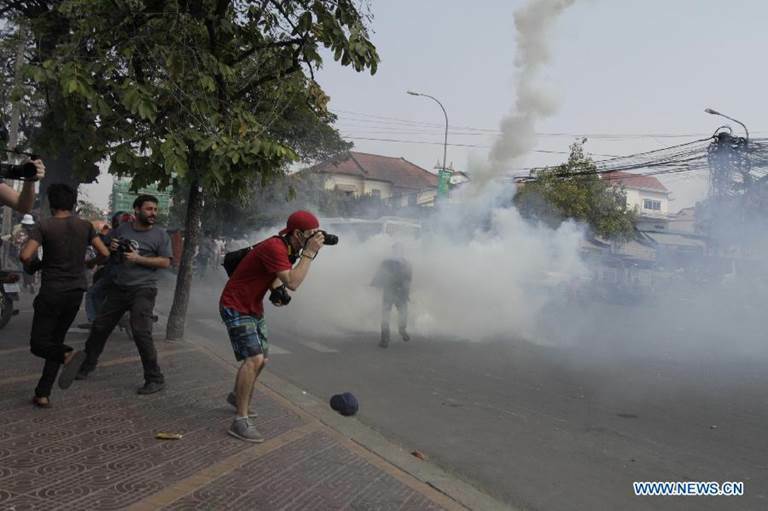 PHNOM PENH, Jan. 27 (Xinhua) -- Cambodian security forces fired smoke bombs to disperse protesters in the capital Monday morning, national military police spokesman Kheng Tito said. Mam Sonando, owner of the opposition-aligned Beehive radio station, defied a government ban on public gathering and led about 200 protesters to rally in front of the Ministry of Information against the ministry's rejection of his request for a relay station and a TV station. Hundreds of security forces had been deployed to defend the ministry's building and dispersed the protesters with smoke bombs and batons since the protesters blocked a road in front of the ministry. "They defied a ban on protests, so we have to disperse them in order to maintain social security and public order," Kheng Tito told Xinhua after the incident. "We cannot let them cause anarchy in society." The dispersal operation lasted about 10 minutes, leaving seven protesters injured on the head and limbs, according to Am Sam Ath, a senior investigator for the rights group, Licadho, who observed the incident. 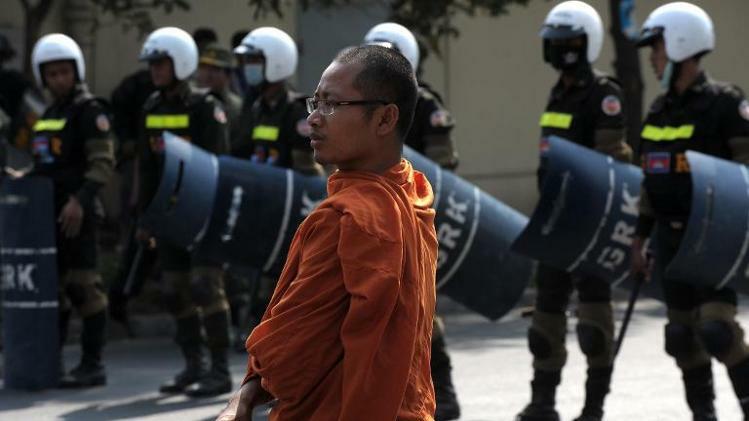 Cambodia has temporarily banned demonstrations since earlier this month in order to restore public security and social order after two protests turned violent, leaving four protesters dead, 26 injured and 23 arrested. 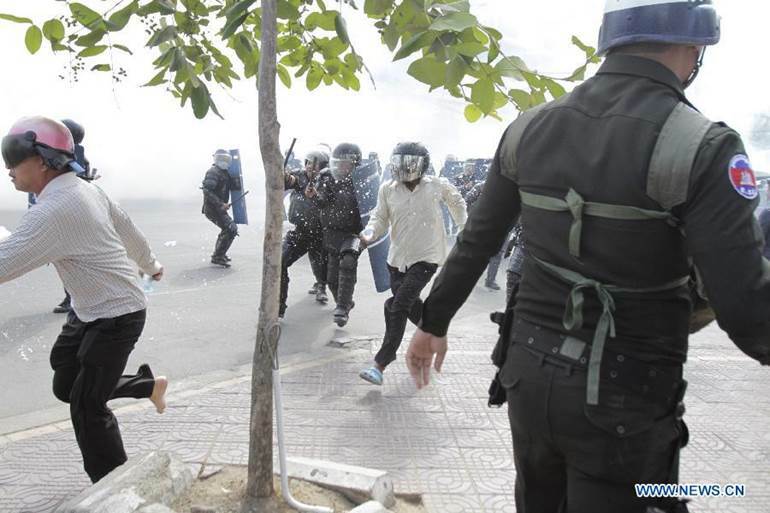 On Sunday, Cambodian security forces briefly clashed with a few hundreds of protesters near the capital's Freedom Park, which left 17 people on both sides injured. 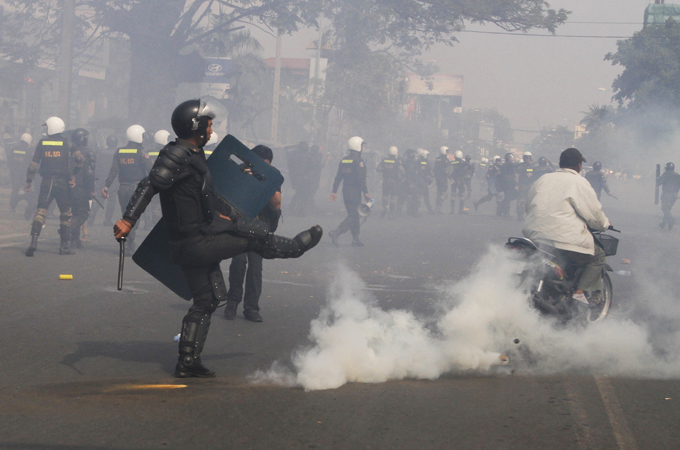 The clash broke out after nine opposition-aligned unions and associations defied the government ban on demonstrations and led the protest to demand the release of 23 protesters detained during violent clashes on Jan. 2 and 3, and a 160 U.S. dollars minimum monthly wage for garment workers. Many rallies and protests have been organized by the country's main opposition Cambodia National Rescue Party (CNRP) and its aligned trade unions and associations since the disputed election in July last year. The poll results showed that the ruling party led by Prime Minister Hun Sen won 68 parliamentary seats and the CNRP got the remaining 55 seats. Claiming serious irregularities, the opposition refused to accept the outcome and has boycotted parliament and held protests to demand the resignation of Hun Sen and a reelection. 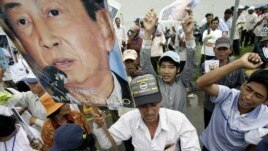 Hun Sen has said that he would neither step down nor call a re- vote. The leaders of the two parties met twice in September in an attempt to narrow their political differences, but the talks failed to produce results. An “intervention” truck from the Daun Penh district police in Phnom Penh. Such trucks are used to transport the police who carry out “street sweeps” of drug users and other people considered “undesirable” by authorities. 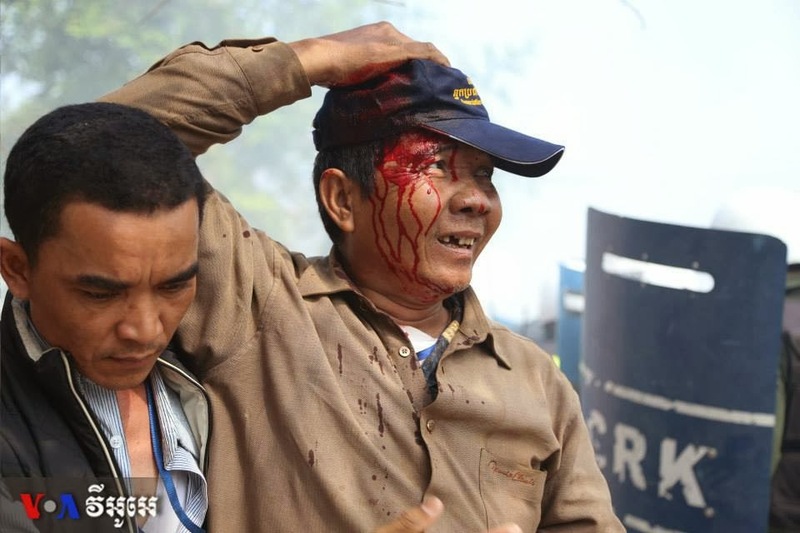 Cambodia became engulfed in a human rights crisis after national assembly elections on July 28, 2013. Final results announced by the National Election Committee (NEC), a body controlled by the ruling Cambodian People’s Party (CPP), returned the CPP, in power since 1979, to a majority in the National Assembly. The assembly then chose Hun Sen as prime minister, a post he has held since 1985. Large-scale demonstrations ensued amidst credible allegations that electoral irregularities and CPP control over election bodies affected the final outcome. Security forces repeatedly used excessive force to suppress post-election protests and social unrest, resulting in two deaths and many injuries. Activist Am Sam Ath of local rights group Licadho condemned the crackdown on the protesters as a "serious violation of human rights". 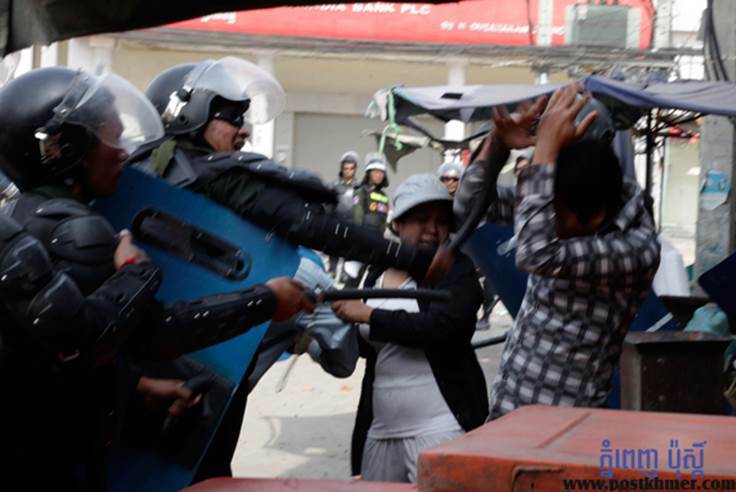 Phnom Penh City Hall spokesman Long Dimanche said police dispersed the protest because it had not been permitted and could have led to violence. "It was illegal demonstration. So the authorities just implemented the law," he said. 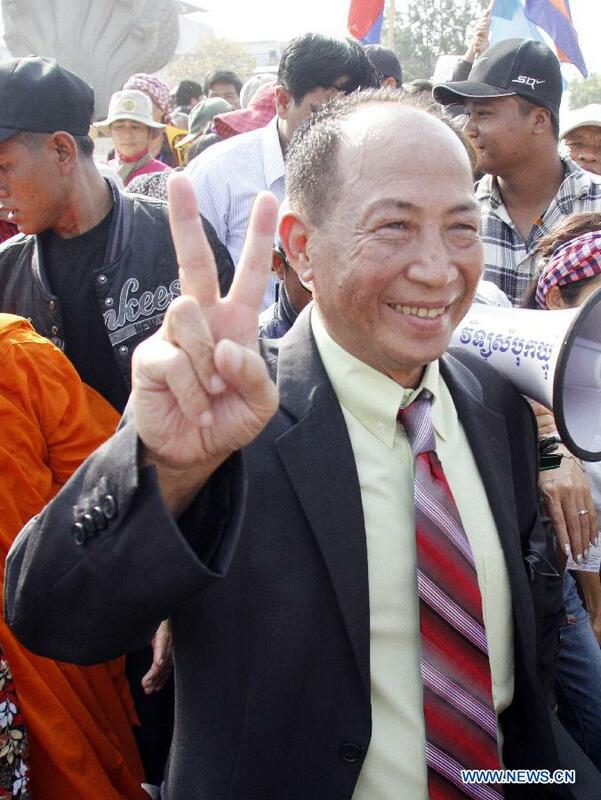 Sonando, who has dual Cambodian-French citizenship, was convicted in October 2012 on charges including insurrection and inciting people to take up arms against the state. He was released from jail last March after a court cleared him of a secessionist plot, slashing his 20-year jail term and ordering his release from prison. 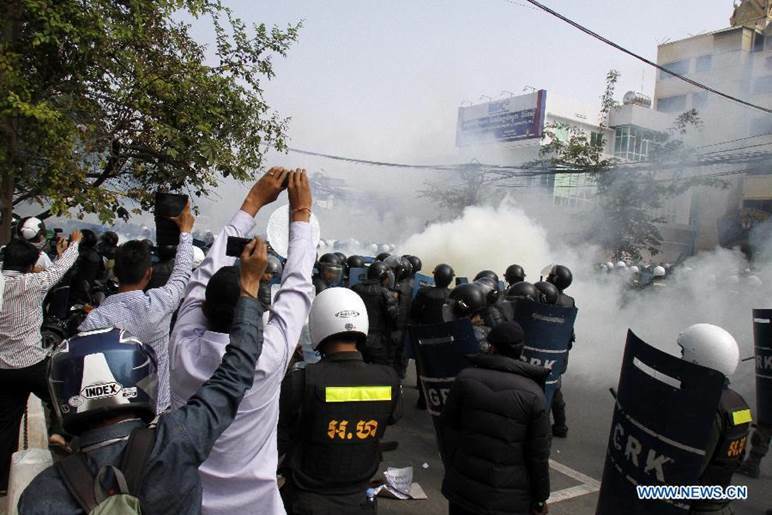 Authorities have quelled recent street protests against strongman Prime Minister Hun Sen.
At least eight people injured as police use smoke grenades and electric batons to disperse anti-government protest. At least eight people have been injured in Cambodia's capital as police fired smoke grenades and used electric batons to break up an anti-government demonstration. Several hundred people, led by radio station owner Mam Sonando, gathered in front of the Ministry of Information on Monday to press demand for the government critic to be allowed a license for a television channel. The government last week rejected the application, saying there was no frequency available. All existing stations are closely linked to Prime Minister Hun Sen and Cambodia has been accused of only granting television licences to pro-government media. 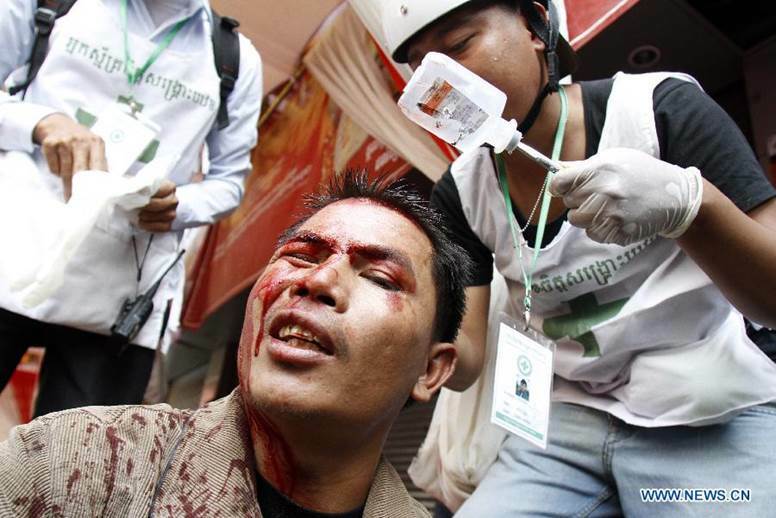 Protesters and journalists were hit by police batons during Monday's rally, according to rights activists. Post by My Hot News. Reuters) - A Thai anti-government protest leader was shot and killed in Bangkok on Sunday when violence erupted as demonstrators blocked early voting in many areas of the capital ahead of a disputed election next week. It brings the death toll to 10, with scores wounded, since protesters took to the streets in November, vowing to shut down the capital and force Prime Minister Yingluck Shinawatra from office. A spokesman for the national police, Piya Utayo, identified the dead man as Suthin Tharatin, one of the protest leaders. "Suthin was shot in the head and in the chest," he said. Yingluck called the February 2 election, hoping to cement her hold on power but the protests have continued and the Election Commission has been pushing to delay the vote. PHNOM PENH — Independent radio broadcaster Mam Sonando says he will go forward with a planned demonstration Jan. 27, in protest of the government’s refusal to allow him to expand his radio reach and open a television station. 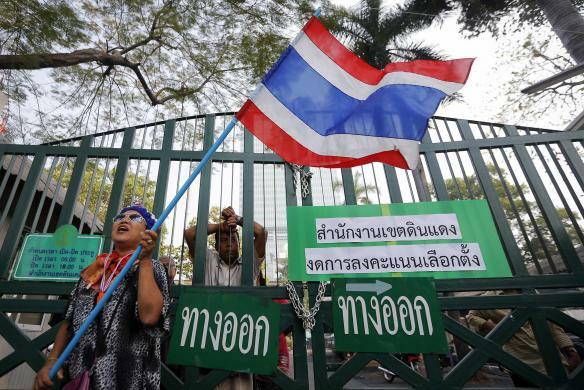 The Minister of Information denied permission for the expansion, but Mam Sonando, whose Beehive Radio broadcasts the Voice of America, Radio Free Asia and other international programming, told reporters Friday the denial is unconstitutional. Mam Sonando said he had been making this request since 2005, but it has always been denied. In a letter earlier this month, Information Minister Khieu Kanharith said the request was denied because Cambodia lacks the space to add new frequencies. A spokesman for the Phnom Penh municipality said the city has not granted Mam Sonando permission to hold a demonstration. 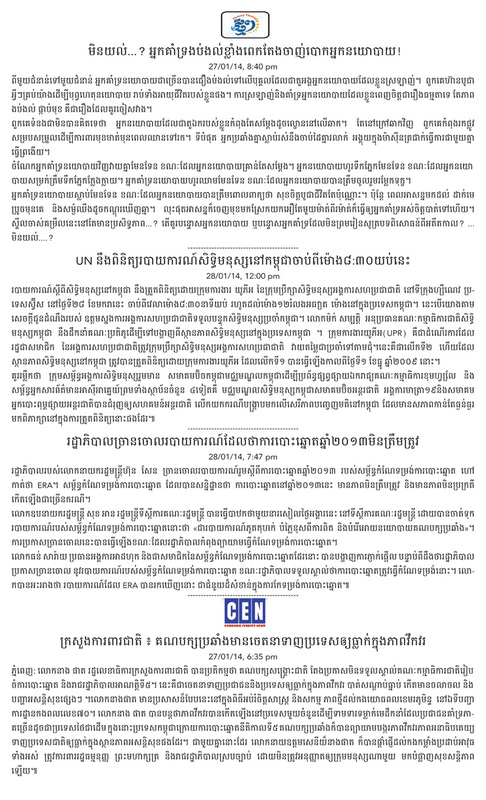 This security message is being issued to alert U.S. citizens residing in or traveling to Cambodia that the leaders of various unions have announced plans for a demonstration of over 10,000 people to be held in Phnom Penh’s Freedom Park (Streets 106/108 between 51 and 63) on Sunday, January 26. Additionally, a demonstration of approximately 200 people is planned for Monday, January 27 to be held in front of the Ministry of Information (#62 Preah Monivong Blvd). These would be the first large-scale demonstrations since the Phnom Penh Municipality announced a prohibition on demonstrations in early January, and Cambodian government officials have publicly stated that these events will not be allowed to proceed. There is a potential for violence should government security forces clash with protestors. The U.S. Embassy notes that violence, including fatalities, has occurred at demonstrations in the past, most recently on January 3. The U.S. Embassy expects that government security efforts for the upcoming demonstrations will include roadblocks around Freedom Park, including Wat Phnom and the U.S. Embassy compound, on Sunday and in the vicinity of the Ministry of Information on Monday, leading to significant traffic disruptions in these areas. The Cambodian government has also highly restricted movement into and around Phnom Penh during past demonstrations, which could also be repeated. Welcome! You have come to the right place. 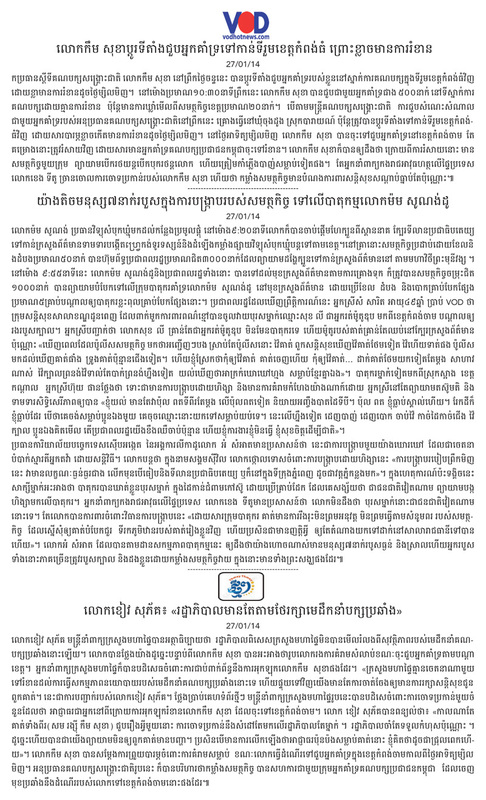 Khmerization is a home to the Cambodian daily news, which is updated twice daily. Please take a tour and enjoy yourself. Thank you. 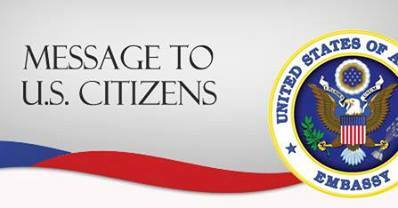 To contact Khmerization please send an email to: khmerization@gmail.com . 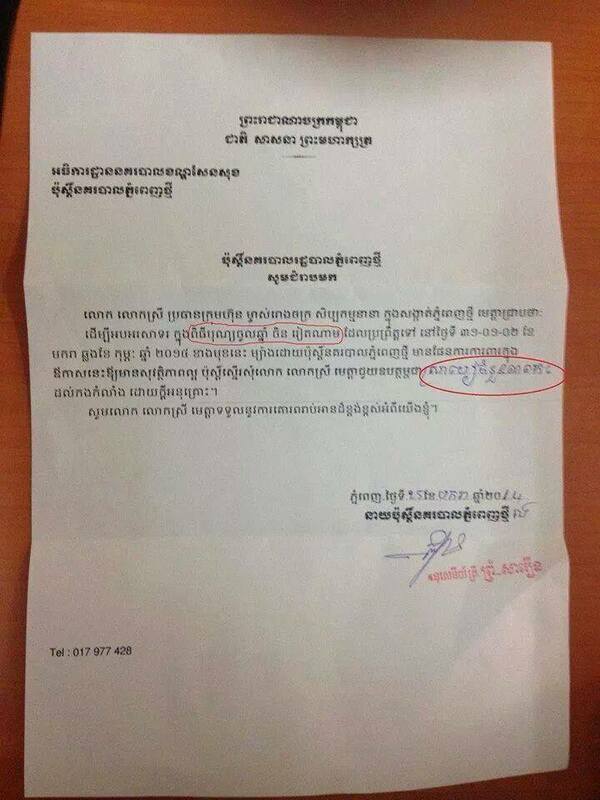 Due to an increase in offensive and profane comments, Khmerization has decided to moderate all comments. Comments containing offensive language, profanities and racist connotations will not be published. Most Powerful 500 Millionaires Made by the Policy of PM Hun Sen! Koh Tral: Is it a Cambodian or a Vietnamese island?